Brucellosis in Arctic Marine Mammals: A threat to team dogs? Janice Howls: Who Belongs in the ISDI? I highly recommend this fascinating, excellent book to anyone with a truly serious interest in dogs as a species, the domestication process, the cultural and environmental effects on breed development, the psyche of the dog. However, for you ISD interested folks, I think the Coppingers dropped the ball on the Northern Breed dogs in general. As you may or may not know, Lorna Coppinger wrote The World of Sled Dogs back in 1977, and it remains a valuable reference work to this day. Raymond Coppinger's personal dog experience is primarily with members of the flock guard breeds, Border Collies, plus his son's Chesapeake Bay Retrievers, Beagles, Bloodhounds, two setter-types and a Pembroke Welsh Corgi. In the kennels of Hampshire College, University of Massachusetts, Amherst, Massachusetts [USA] there are also New Guinea Singing Dogs to represent some primitive aspects of dog behavior. His experience with traditional sled dog/northern dog breeds includes a white husky-malamute mix, and some Siberians and Alaskans - all from the sprint race point of reference. Besides behavior, he studied footpad sweating of domestic canines compared with Western coyotes, Eastern coyotes and wolves. He also makes frequent reference to the village dogs of Pemba, an island off the coast of East Africa, politically connected to Tanzania. The scope and depth of his experience is massive, yet I found myself alternately delighted and disappointed every other page. Coppinger states, "Dogs may well be closely related to wolves, but that does not mean they behave like wolves. Any breed of dog behaves with much greater complexity than any wolf." He later clarifies that "the dog is simply a derivative of the ancestral wolf, a new form that is adapted to feeding on a new source of food." "I don't think a dog knows what people are talking about when they exhibit this 'alpha wolf' behavior. Dogs do not understand such behaviors because the village dogs didn't have a pack structure; they were semi-solitary animals." To be fair, Coppinger later differentiates between pack behavior and dominance hierarchy. Pembans raise and eat chickens, cows, goats, vegetables and fruit. Pembans value chickens and dislike dogs, do not keep them as pets. Dogs that live there must not kill livestock or bite children or raid gardens. Yet Coppinger refers to Pemban dogs as classically typical of the original dog, not accounting for the cultural selection for passivity, agricultural adaptation and therefore against aggressive, assertive, "pack-like" behavior. He does not consider that early human cultures that were not based on agriculture and large numbers of free-roaming domestic animals might well produce a very different mind set in humans and dogs. Agriculture is climatically limited in the northern latitudes. The selective forces of an agricultural culture are therefore not in play on the dogs of such areas and such peoples. The only acknowledgment of North versus South is that "village dogs tend to be bigger, adapting them to colder climates". He believes that dogs are coincident with permanent human settlements. Coppinger highly recommends mixed breed, mongrel, cur dogs over purebreds. He feels that the millions of ubiquitous strays are not discarded crossbreeds, but actually the original non-wolf, the village-adapted form. He doubts that the average shelter's identification of a dog being a cross of A & B is correct. While I would agree that shelter personnel are generally not too savvy and sometimes political in their statements about the probable parenthood of a dog in their custody, I do feel that any popular or common purebred, which may vary with the area, is more likely to contribute to the local mixed breed population. Owners of purebreds, even those from puppy mills, are more likely to keep their dogs intact with the hope of making back their money by selling registerable pups. Additionally, those who allow their dogs to reproduce at will, who may have a litter of mixed breed puppies, are much less likely to provide the critical socialization that dogs need to develop optimally. So the idea of wholesale recommendation of mixed breeds as pets is faulty and incomplete at best. The veterinary literature contains more than one report of a mixed breed with the faulty genetics from both parents. "Humans have captured and caged entire populations of dogs and bred them into bizarre shapes, often creating freaks. These latter dogs lead impoverished lives... their very shapes predispose them to lead painful and sickly lives." When referring to some essential, typical behaviors he writes that "the behavior cannot be cured with a drug. Nor can it be cured with training". And again "the improbability of training many specifically natured dogs to be other than what they were bred for." He incisively ridicules the idea of wolves and wolf hybrids as sled dogs. "Just because the character is there, does not mean it was selected for." "Nor does it mean people selected dogs to bark at strangers. Many species recognize and appropriately respond to the alarms calls of other species." 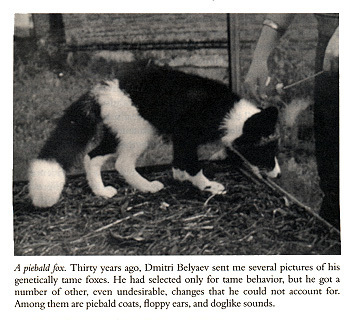 The observations on Dr. Belyaev's foxes which were selected for tameness to improve handling efforts on a Siberian fur farm, and the parallels to domestication of dogs is worth the purchase price alone. Especially clear is the effect of selecting for one trait only, and ending up with an entire package of modifications, not all of which are desirable. "Rule: As the quality of food increases, aggression between dogs escalates." 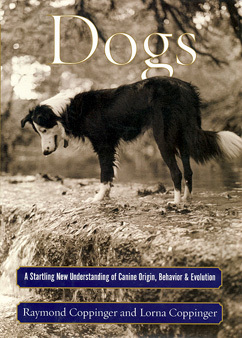 He emphasizes the importance of the critical period of social development between two and sixteen weeks of age, a period when "dominance hierarchies are formed and dogs learn and practice their submissive behaviors" There is also reference to the critical physical development of the wiring of the brain at an early age. "Even if the impoverished pup gets taken to an enriched environment as an adult, it cannot learn to cope with that environment because it does not have the necessary cell connections." My own copy of this book is marked up like a used college text. I could spend many more pages listing interesting and provocative quotes and some of my reactions and comments to them. I would rather that you purchase your own copy and take your time reading and considering what is written. There are so many books about dogs that few readers have the time to sift through the mud for the nuggets. This one is a nugget and will fast track the reader through much of the basic research that has been done on dogs in significantly less time than it takes to locate half of the titles online. For your self-constructed course in Cynology 101, this is a basic text. The provocation to thought is definitely worth the effort. Scribner. ISBN 0-684-85530-5. USA price $26.00; Canadian price $36.50.